Now What! : UK joins in protest against President Trump's immigration ban on Muslims. UK joins in protest against President Trump's immigration ban on Muslims. 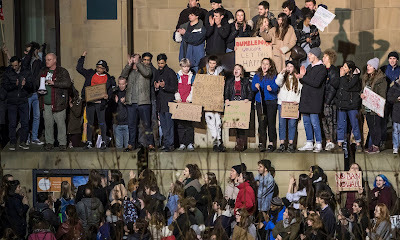 'Thousands have gathered across the UK to protest against Donald Trump’s travel ban targeting seven Muslim-majority countries, his indefinite bar on Syrian refugees and his planned UK state visit. 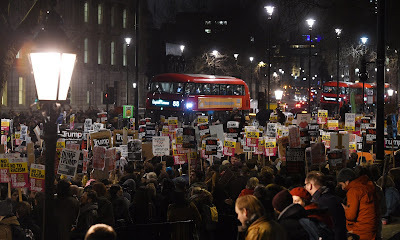 About 10,000 people were thought to have marched on Downing Street in London, with the crowd stretching the length of Whitehall by 7pm. 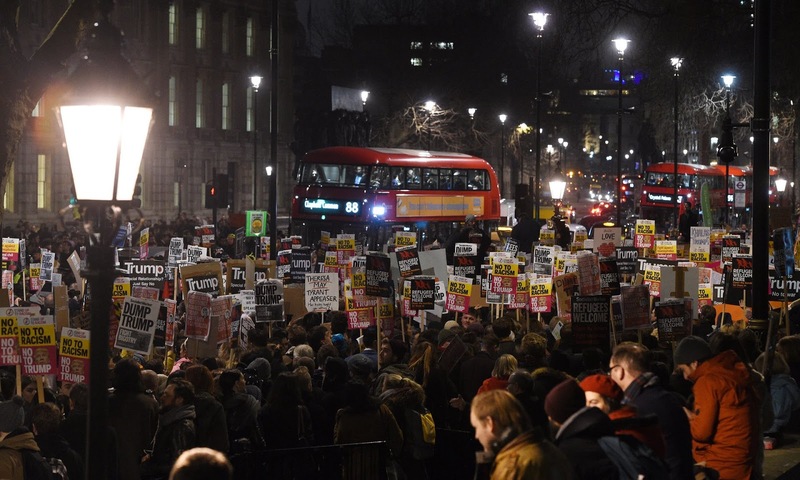 Edinburgh, Cardiff, Manchester and Birmingham also had large demonstrations. 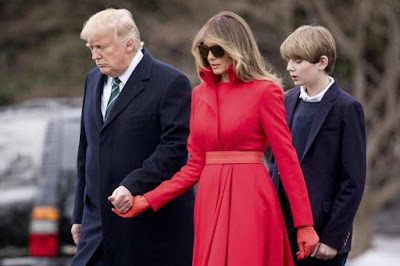 Protesters showed their anger on the day that a petition calling for the US president's visit to the UK not to be classed as a state visit passed 1.5m signatures. Speakers in London on Monday evening, including Labour peer Shami Chakrabarti, were barely audible above the chants of “refugees welcome here”, and “Theresa May, shame on you”. Demonstrations were also under way in Gasglow, Aberdeen and Dundee. Placards and banners were held aloft in the former as a crowd of about 500 people chanted “hope not fear, refugees are welcome here”. Glasgow’s demonstrations continued in George Square after a three-hour rally in Buchanan Street. In Manchester, a crowd gathered at Albert Square, outside the city’s town hall. The site is a stone’s throw from Lincoln Square, where a statue of Abraham Lincoln, the 16th US president, was erected to give thanks to Lancashire’s cotton workers for “their fight for the abolition of slavery during the American civil war”, after an economic blockade of slave-picked cotton from the southern US states caused massive unemployment in the region’s cotton industry.